Queen Rania and her daughter Princess Salma getting ready for the event. 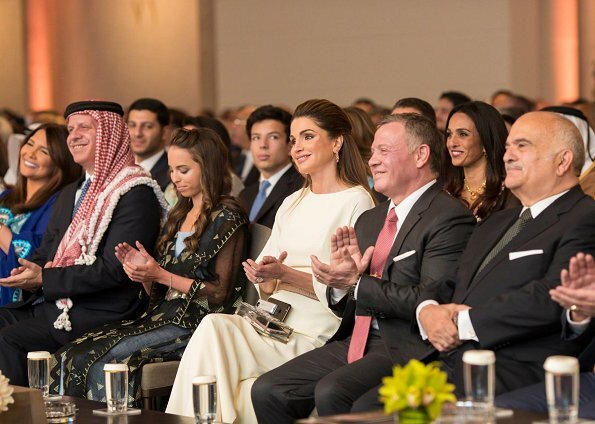 Queen Rania's dress is gorgeous and princess Salma looks good. Totally agree. What a great dress. Absolute perfection, hair, makeup, gorgeous dress. Classic elegance. I love it, what I really seldom do about Rania´s clothes. It is always nice to see how good relationship Rania and Abdullah have. Salma is beautiful girl. The Queen looks phantastic. Lovely pictures of Mother and daughter! Today she nailed it. Perfection, dress, hair, jewels and shoes. Not normally a fan of Rania's style, but this gown is stunning. Perfection from head to toe.